You are here: Home » Duo Fibre Frenzy! I’ve become a little bit obsessed with duo fibre brushes lately and I just can’t get enough! I’d been eyeing the MAC 187 for ages but I just couldn’t justify spending $80+ on a brush that I hadn’t even used yet. I ended up getting the Sigma SS 187 about 2 months ago and after using it for a while I decided that I really wanted to get the MAC 187. That’s right about the time I stumbled on to http://www.allcosmeticswholesale.com/ which sells authentic MAC (and other brand) products for about the same price as US retail which is half the Australian prices. This site also sells individual Sigma brushes which is so great because there were a few brushes I wanted from the premium brush kit but couldn’t buy individually online. At the moment the duo fibre brushes I have are the MAC 187, Sigma SS 187, Sigma SS 188, MAC 130 and Sigma SS 131. 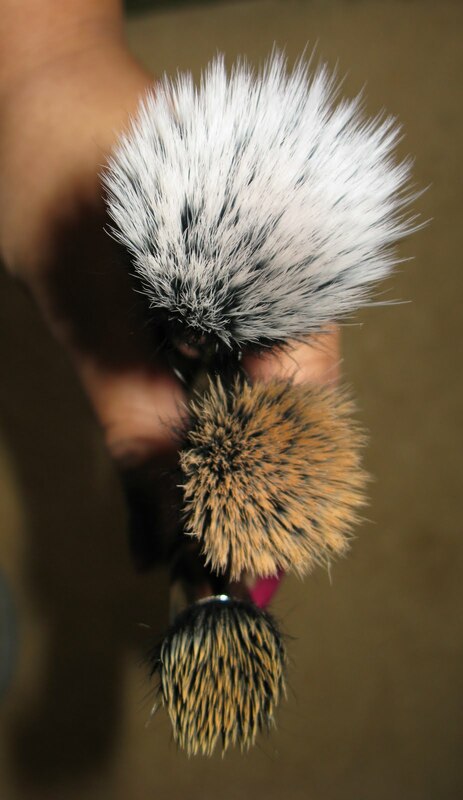 I also ordered the Sigma SS 197 which is a flat top kabuki brush which I thought was a duo fibre brush but is actually just a full synthetic brush that is made to look like a duo fibre brush. 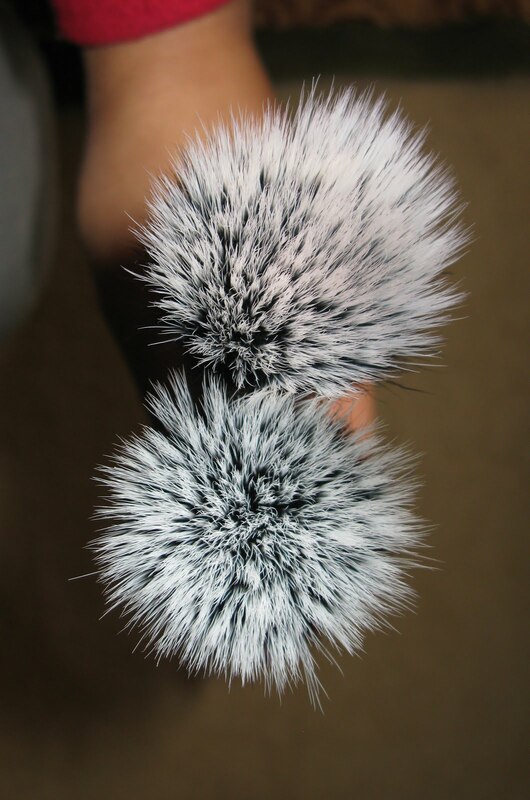 For those who don’t know, the reason that these brushes are referred to as duo fibre is because they are literally made of two fibres with the black fibres being a natural hair such as goat hair and the white fibres being synthetic. I haven’t received the SS 197 yet but I’ll do a post on it once I receive it. So I took some pictures of all the duo fibre brushes I have and I’m just going to talk a bit about them and what I’ve found them to be good at. 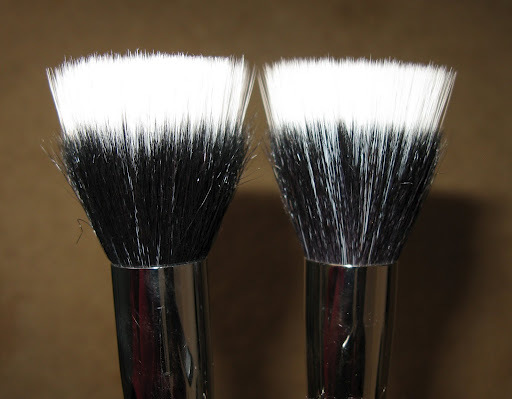 Firstly here are both of the 187 brushes. The SS 187 is on the left and the MAC 187 is on the right. In this second picture the SS 187 is on the top and the MAC 187 is on the bottom. So my first thoughts on these brushes is that the difference in them seems to be quite negligible and I don’t particularly like one over the other. Actually that’s not true because after testing them both out and trying density tests, softness tests and application tests, I have to say that the Sigma SS 187 is probably my favourite. The reason for this is that the Sigma brush is more dense than the MAC brush. 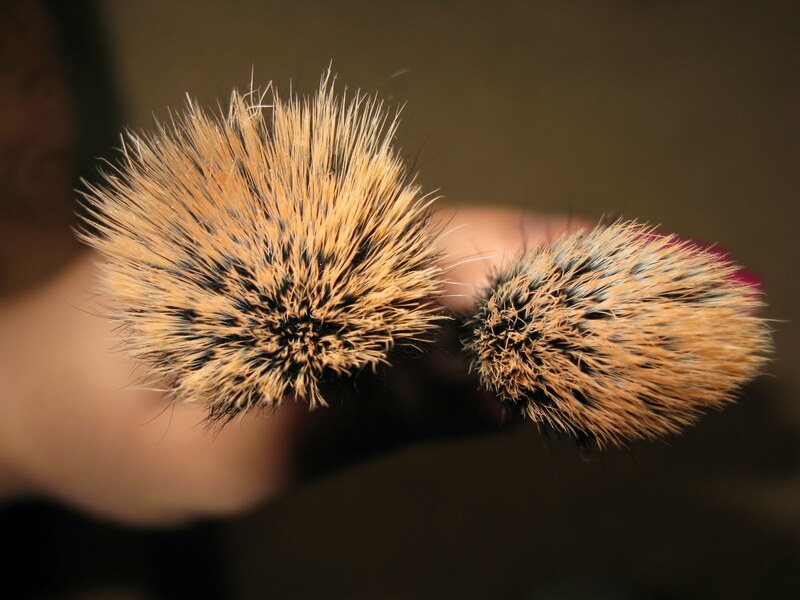 When you look at the picture above you can see that the white bristles are probably equally dense but when you look at the first picture you can see that there are a lot more black bristles on the Sigma brush. 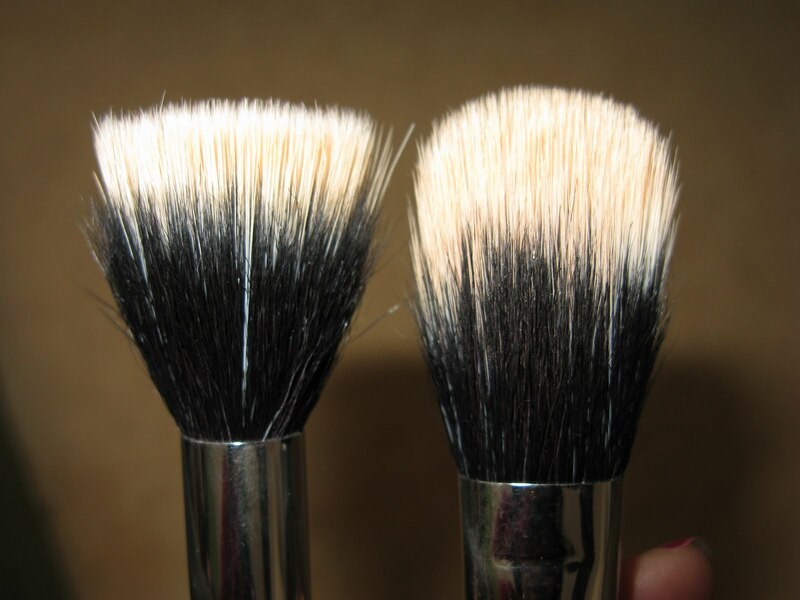 However, like I said initially, the difference is not that big but I guess if I were to use this type of brush for foundation application I would use the Sigma brush. Personally I actually don’t like either for liquid foundation application but love them for my face powder application. I usually set my liquid foundation with a dusting of Studio Fix powder but I feel like the powder shows up too cakey when applied with my MAC 150 brush but with either the SS 187 or the MAC 187 the application is perfect. It deposits the right amount of product to set my foundation. The next brushes I’m going to talk about is the Sigma SS 188 and the MAC 130. Here are some comparison pictures. Each of the 2 pictures below shows (from top to bottom) the SS 187, SS 188 and the MAC 130. I decided to get the SS 188 brush because I found the SS 187 and the MAC 187 to be too big for pigmented blush application so I wanted something smaller. The SS 188 is great for blush! 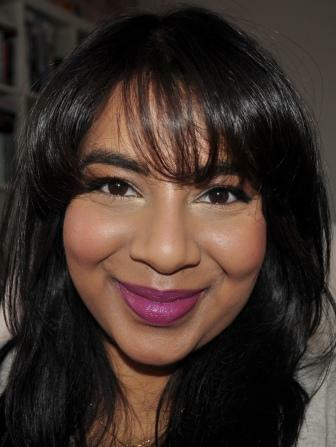 It’s the right size to apply blush on to the apples of your cheeks and along your cheekbone. I know some people love the 188 for liquid foundation application but I didn’t find it to be dense enough to achieve that ‘air brushed’ look everyone raves about. It’s great for blushes though and it works wonderfully with my NARS Exhibit A blush which is so pigmented and can easily end up looking crazy on the cheeks without a light hand. My new HG brush for liquid foundation is definitely the MAC 130 brush! It’s so great! I know people were a bit upset by the size of this brush and thought it was too small but I think that the size is what makes it more effective. It’s really small, tightly packed, dense and has short bristles which means that it actually blends out foundation so well and definitely gives that ‘air brush’ look or somthing close to it. The size also means that it can get into all those areas that the other brushes can’t like the side’s of your nose and around the tear duct. Because of how dense it is, it’s the first brush I’ve used that blends out my Studio Sculpt enough that it actually looks like I’m not wearing foundation. 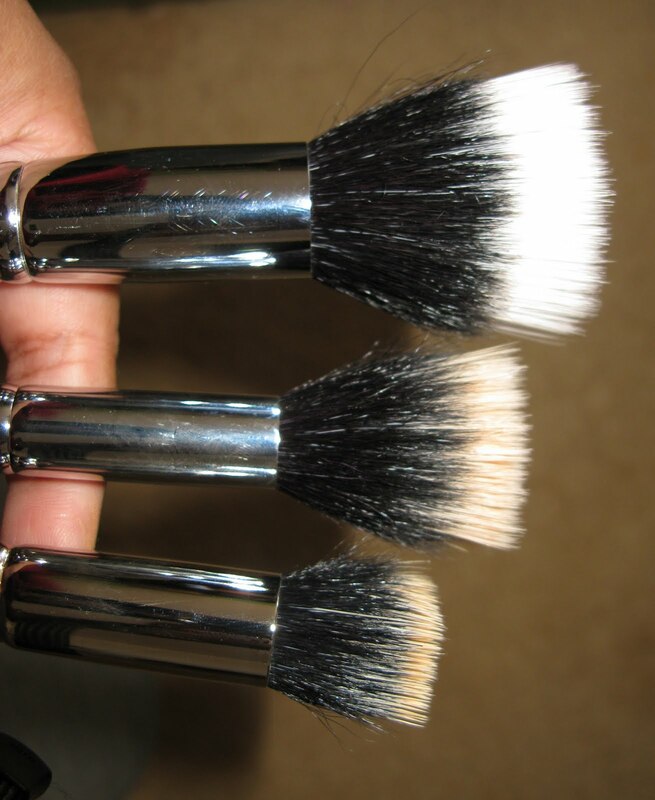 This is definitely the brush to go to for those thicker consistency foundations. I can see why it was released with the MAC Mineralize SPF cream foundation because with other brushes this foundation would either go on too sheer or too thick. Love, love, LOVE! The last brush that I bought was the Sigma SS 131 and it’s supposed to be a dupe of the MAC 131 which I couldn’t find anywhere which is why I went with the Sigma version. The MAC 131 was released with the Color Craft collection and was made to be used with Mineralize Skin Finishes and it’s supposed to allow you to apply very shimmery products like the MSF’s more subtly. Here are some pictures showing a comparison with the SS 188. The SS 131 is on the right in both of the pictures below. Sorry that both brushes are dirty but I just used them! So as you can see the SS 131 is a lot flatter and narrower and has a shape which is a mix between a traditional foundation brush like the 190 and a highlighter/contour blush such as the 109. I’ve been using this brush with my MAC Iridescent loose bronzer in golden bronze and I really like the result. This bronzer is so shimmery that it can easily look too over done during the day but by using this brush the look is definitely a lot more subtle. It’s also the perfect shape and size to sweep the bronzer along your cheek bone. That’s my thoughts on the duo fibre brushes. If I had to choose just one brush for it’s versatility I would probably choose the 188 just because it’s small enough to do blush application but can also be used for foundation (though I prefer the 130) and can also be used for application of face powder. Hope this is helpful to someone out there!